Gather a group and save! Seniors, tour companies, churches, family reunions, community organizations and more can save on Adventure Halls, IMAX and combo tickets when you make advanced reservations for 15 or more people. To make reservations for a group trip, please fill out the group request form at the link below, or contact reservations@mcwane.org or 205-714-8267. 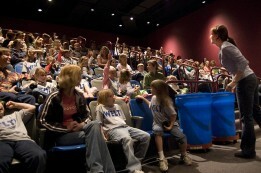 If you would like to book a trip for your school, daycare, or summer camp, please visit our Field Trips page.